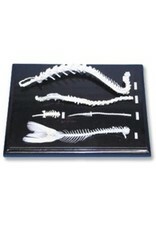 Skeleton Specimens are real animal bones, cleaned and specially treated. 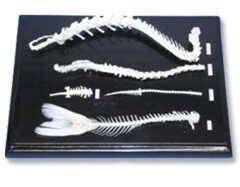 Each specimen is articulated in a natural posture and mounted on a finished wooden base with removable clear acrylic cover. Comparison sets consists consist of the particular bone structure from a specimen in each of the five classes of vertebrates: Mammal (Rabbit), Birg (Pigeon), Reptile (Turtle/Lizard), Amphibain (Frog or Toad) and Fish.